Alan Burleigh (judge) with Brendan Reavey (SAFE) Co Armagh sponsor, James and Kieran Rice, Co Armagh, and Kevin Reavey (judge). With Charolais taking top prices at local markets across the province, it’s no surprise that places were hotly contested for the title “NI Charolais Suckler Herd of the Year”. The competition attracted significant entries from commercial breeders across the province. The Northern Ireland Charolais Club recognises the importance of producing quality beef and sought to promote and demonstrate the strength of a Charolais sire on the herd. The club encouraged entries from breeders who were focused on the promotion of the best and most sustainable Suckler Herds in Northern Ireland, with all herds producing commercial calves using a pedigree Charolais bull. Alan Burleigh and Kevin Reavey took on the task of judging the herds. Both these young gentlemen represented the UK in youth stockjudging competition in France after winning the UK section, with Kevin coming first and Alan coming in a close second. Kevin and Alan were reviewing calving return, calving pattern and carrying out visual assessment on each farm. They remarked on the superb confirmation and quality produce across all farms and were impressed with the length and muscle within the top herds. Here is a report on the top two in each county. Co Armagh and overall winner for 2018 is Kieran and Shane Rice based in Collone outside Armagh. They run a successful commercial herd of c.80 cows along with a range of Charolais Bulls. They operate mainly on a calf to weaning system by which their calves regularly win prizes and top the market at specialist weaning sales. Calving is carried out mainly in early spring with calves reaching suitable weaning weights to achieve optimum returns from the cow herd. 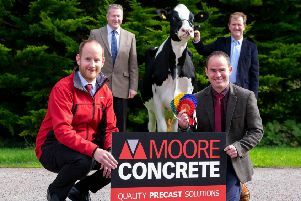 The runner up in the county was Mr M McNally based outside Portadown, where he operates a spring calving calf to weaning system across a large commercial herd of cows. He operates with Charolais bulls across his cows and showed a number of quality calves at the NI Charolais sponsored sale in Dungannon this year. This year the county winner was Mr S Gowdy. He operates a large commercial herd of over 160 cows alongside his wife on the outskirts of Carrickfergus. The farm system is a mixture of calf to weaning with calves both selected off farm and in local markets by regular customers eager to purchase some of the quality the farm produces. The majority of cows calf in early spring with approximately 30% autumn in order to produce a range of calf ages for different customers throughout the year, a system that has been working well for the family over the years. Second place in the county went to father and son team Trevor and Alexander Butler close to the holiday area of Ballycastle. Here they operate a spring calving herd of mostly west of Ireland bred cows which are successfully crossed to a Charolais bull. They aim to produce a quality calf easily fleshed from their cows in order to sell in special suckler sales. First place for Co Down this year was F Reid based outside Ballynahinch. He operates a quality mix of 25 cows which are crossed to Charolais bulls, with the aim of the system to produce quality early spring born calves to sell at autumn sucker sales, where many return buyers seek to purchase his calves. His current stock bull was purchased a number of years ago in a Dungannon sale and Mr Reid is very impressed with the quality of the calves that he is leaving. Runner up in the county was Stephen Heenan, who lives near Downpatrick, where he operates a substantial 70 cow spring calving herd. Cows which are a quality mix of breeds are crossed to terminal Charolais bulls with all calves brought through to beef on the farm. County winner was Ivan Tanner who lives just outside picturesque Castlerock with views onto the North Atlantic ocean. The farm consists of approximately 30 quality commercial cows and a Charolais bull in order to produce quality calves with the heaviest weights in the quickest time. Calving is mostly late autumn with calves sold in local markets when they reach approximately 380-420kgs and Ivan commented he is very happy with the quality the Charolais leaves in his calves. In second place was Mr J Campbell who farms outside Upperlands. He operates a calf to forward store system on an autumn calving herd of approximately 60 cows, alongside a large sheep flock. The busy farm crosses cows to an easy calving Charolais bull and aims to keep the calves through to weights of c.450-500kg before selling through local markets to specialist finishers, an operation that he is currently working well for the business. G Law was the county winner this year with his large commercial herd of cows outside Ederney. They run a number of Charolais bulls across the predominately spring calving herd of cows with the aim to sell calves as weanlings of suitable weights in local markets to maximise returns from their cow herd. Second place this year was Mr Moane who farms outside Fivemiletown with a herd of approximately 30 cows with Charolais the number one choice. The spring calving herd produces calves to sell at local markets at weights of approximately 350-400kgs and achieving top prices for their produce. The county winner this year was Ronnie Scott from Gortin. Here he and his son Mark operate a substantial 50 cow early spring calving herd, alongside a busy sheep flock. They run a number of Charolais bulls across the herd of cows and aim to produce quality weanlings for sale in the autumn suckler sales particularly in Plumbridge where they were quite successful this year, which is no surprise with the quality of calves they had this year. In second place this year was N McIlwaine based outside Plumbridge where he farms a 60-cow early spring calving herd of quality cows crossed with terminal Charolais bulls. They operate on a calf to weaning system with calves produced for special autumn sales, where again many return customers attend to purchase these sought-after calves. Each year this is evident at sales with the McIlwaines regularly gaining prizes and achieving top prices at these sales. Top firms from across the province were also keen to get involved. The Northern Ireland Charolais Club acknowledged that they were indebted to their support for the competition. Results were announced at the club show and sale held in Dungannon market on November 2 and were awarded as follows. Northern Counties Co-Operative Enterprises Ltd – Co Londonderry Champion – Ivan Tanner. The Northern Ireland Charolais Club wishes to record its thanks to all competitors and sponsors.